Yes, in many cases that is probably true. If they work, they do pay payroll taxes. If they smoke, they pay the federal tobacco tax. If they drive, they pay the federal gas tax. If they buy imported products, they pay import tariffs. But let’s not forget that federal fiscal policy is a two-way street. Washington collects tax revenues in order to spend it to benefit people. And to one extent or another we all get some benefits from government, even if we may not perceive those benefits or want them. The point is, that if we are going to talk about how much people pay in taxes, it is fair to do a full fiscal accounting and see how much they also get back in federal spending relative to the taxes they pay. The Tax Foundation first looked at this question in 1967, again in 2007, and most recently in 2009. Each of these studies show that federal tax and spending policies are very progressive and very redistributive. The Congressional Budget Office gives us another piece of evidence on how redistributive the federal fiscal system has become is their recent publication The Distribution of Household Income and Federal Taxes, 2008 and 2009. In their supplemental tables (Table 6), they provide their estimates of how much the average household in each quintile pays in total federal taxes compared to the total amount of federal transfer income[i] they receive. As can be seen in the charts below, the results for 2009 are quite shocking. Basically, we find that the first three quintiles (including the “middle-class”) all received more in transfer income than they paid in all federal taxes, while the fourth quintile was virtually at parity. 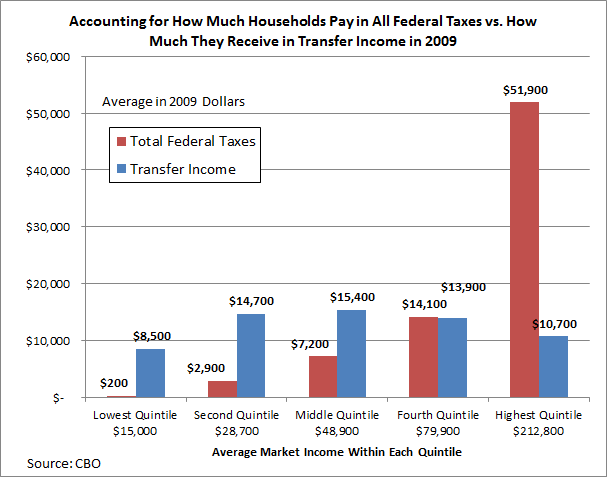 Only the top quintile paid substantially far more in total taxes than they got back in transfer income. On the tax side, we can clearly see the results of refundable tax credits – such as the EITC and the child credit – combined with “stimulus” measures such as the Making Work Pay Credit. For the lowest quintile, these refundable measures reduced their total federal tax bill to a mere $200. By contrast, their transfer income was $8,500. This means, they received $42.50 in transfers for every dollar they paid in taxes. However, the total tax federal tax burden for households in the middle quintile was less than half of what they received in transfer income. 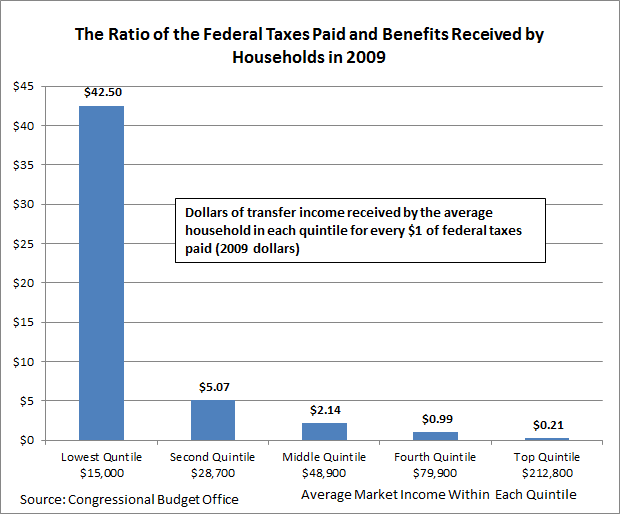 In other words, these middle-income households received $2.14 in transfers for every dollar they paid in federal taxes. It is quite surprising to see that even households in the fourth quintile are essentially getting as much back in transfer income as they pay in taxes. Were we to include the value of other federal spending, it’s clear that these households are net beneficiaries of government. (No doubt this somewhat reflects the fact that taxes cover only 60 cents of every dollar the government spends). Lastly, households in the top quintile pay an average of $51,900 in total federal taxes but receive $10,700 in transfer spending. This means they receive 21 cents in transfers for every dollar they pay in federal taxes. Mitt Romney was ridiculed for his comments on the “47 percent” and the issue of dependency, but CBO’s report illustrates that at least the bottom 60 percent of households now receive more in federal transfer income than they pay in total taxes and that it may not be long until 80 percent of Americans are net beneficiaries of transfer income. This raises an obvious and troubling question: Is it reasonable or fiscally responsible to ask the top 20 percent of households to pay for the government benefits of the other 80 percent of households? [i] Government transfers are described on p. 24 of CBO’s report a “cash payments from Social Security, unemployment insurance, Supplemental Security Income, Temporary Assistance for Needy Families (and its predecessor, Aid to Families with Dependent Children), veterans’ programs, workers’ compensation, and state and local government assistance programs. 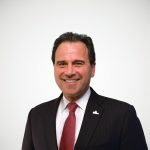 They also include the value of in-kind benefits, such as Supplemental Nutrition Assistance Program vouchers (formerly known as food stamps), school lunches and breakfasts, housing assistance, energy assistance, and benefits provided by Medicare, Medicaid, and the Children’s Health Insurance Program. (The value of health insurance is measured on the basis of the Census Bureau’s estimates of the average cost to the government of providing such insurance. )” Total transfers do include some state funds, but this is less than 10 percent of the total.